I’m learning two main languages, Spanish and Swedish. I’ve been using Duolingo to learn them of late (in fact, I’m more-or-less relying on Duolingo at the moment, which isn’t good; you should use more than one resource to give you good variation). I’ve been doing around 30 minutes a day for each language, which is the bare minimum you should do. Work on and complete the “reverse tree”; that is, the English for Spanish speakers course (which is a learnsome challenge). Then keep that gold. Start the online virtual Spanish classroom from the Cervantes Institute, probably at B1 level. Go and sit a B1 level DELE. This will make me firmly intermediate in level. I should have started step 3 by Summer 2017, and maybe completed step 4 by the following summer. When Finish step 4, I’ll work out the best way to keep that level and build on it. The ultimate goal is to be C2, of course. I was stuck on Swedish for a long time. I kept mucking up infinitives and this sapped my energy. But I’ve been powering on lately. Moving onto new topics has got me pretty excited. In particular, I have loved getting to grips with the kommer att future form and the håller på present continuous. There’s a lesson for you: don’t get bogged down on troublesome topics, as it will kill it for you. Just keep moving. Finish and keep the Swedish for English speakers tree golden. There is no English for Swedish speakers course, so I need to start a distance / online / self-learning course at B1 level (I am, more-or-less A2 right now). 2016 actually marks ten years of learning Swedish(!) I’m pretty sure I should be fluent right now. Cambridge recommends 1000-1200 hours to be fluent (C2); so, studying an hour a day, I should have been at C2 level by 2010. But more on that next time! 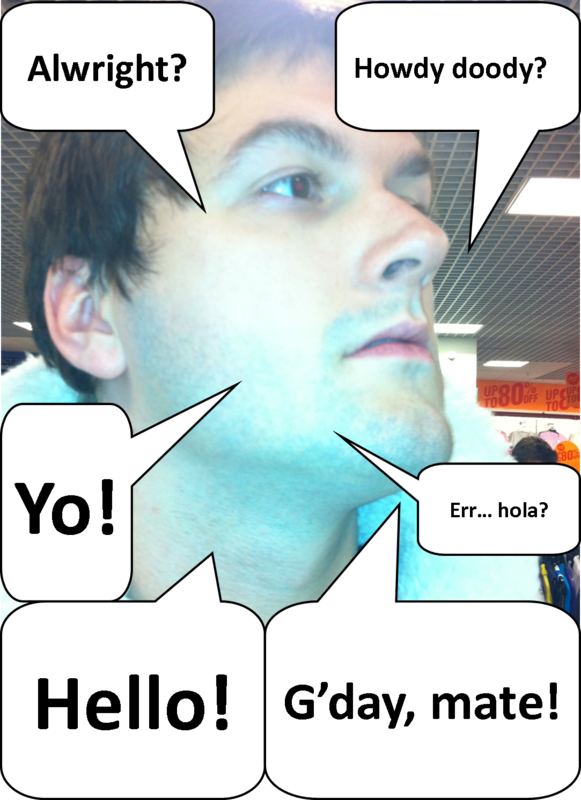 Project Polyglot Parry: my personal quest to turn myself into a multilingual maestro. But I haven’t really applied myself to the task well of late. So one of my major new year’s resolutions for 2016 is to get back on track with my language learning. Part one of which is to start regularly doing Duolingo in Spanish and Swedish again. Well, I have now started. One of the best ways of sticking to personal goals is to tell everyone. This way, social stigma forces you to see it through. Consider yourselves told. Project Polyglot Parry is me turning myself into a multilingual maestro. Unfortunately, despite being pretty regular on Duolingo, the graphic below(PROJECT Polyglot Parry March 2014) is still an accurate reflection of my language levels. How can that be possible? I’m where I was 22 months ago! Ah yes; a combo of not enough practice and not pushing myself enough when I do practice. Well, learning languages is on my 2016 New Year’s Resolutions, so I’ve got to get a grip. Enrolling on a class might be the way to force myself forward. I don’t want to make excuses or put things off, but I am actually in the middle of several really important life things right now. I physically don’t have that much time. But I’m going to force myself to Duolingo again, effective immediate; I can do it on the bog (half an hour per language per day). Then I reckon in a couple of weeks or so, I can think about enrolling on classes and so on. Doing Portuguese Duolingo half an hour / two “disks” per day for the whole year. As much as I’m keen on Basque — I’ve always loved the language, my wife is Basque, we have a house in the Basque Country –, I decided to only focus on learning that when I am certified C1 in Spanish. In my post Bryan & Idoia’s Wedding 1: Ceremony I linked you to a video by Gag Producciones of my wedding ceremony. Here is a video from the same company of the surprise video that me and my bride, Idoia, arranged for all the guests — but particularly her brother. The video was shown during dinner. The video was mostly filmed and edited during the day itself before it was shown. Top work from Gerardo and Romina at Gag Producciones. I’m quite a private person. I like to keep certain things to myself; I didn’t even tell my work colleagues that I was getting married. They found out whilst I was away. Hilarity ensued upon my return: But.. you got… whuh!?. But despite that, I’m quite proud of the wedding me and my wife managed to arrange. And so, whilst I’m too shy to share it with any actual humans, e.g., my work colleagues, I feel free to share it with you netizens. Below is a video of the ceremony filmed by gag producciones which I’ve put on my YouTube channel. I hope it gives you pleasure and maybe even some ideas for your own wedding. I’m an English teacher, linguist, and language nerd. However, I can’t speak any foreign languages; well, not properly anyway. I really do get turned on by reading about grammar and how different languages have differing strategies in how to approach any given area of communication. It thrills and delights me. People see my interest in languages and assume I’ve reached a pretty decent level in several. So they’re always disappointed to find out I only know English. “So, you’re not really a linguist then, are you?” they aggressively assert, apparently angered by being swindled out of what they thought was a genuine encounter with that most impressive and rare of beasts, a polyglot, an English polyglot to boot! I always retort that the greatest living linguist, Chomsky, only speaks English. Well, that’s nothing more than a grown-up version of the child’s comeback that,”I am rubber, you are glue…” Doesn’t convince me, doesn’t convince them, barely saves face. And Chomsky’s getting on, so I won’t even have that lame retort for much longer. My problem is that I’m such a procrastinator and I always find an excuse to get distracted before I achieve my goals. I genuinely think I’ve got some kind of climax fear; I’m a bit of a perfectionist and this often holds me back. It manifests itself in all areas of my life; for example, chess: I always set up my pieces into a solid defensive formation, a real fortress, and then what? I just sit back and wait for my opponent to make a mistake. I get a kind of performance presure paralysis when it comes to me taking the first move. I think, when you get down to it, I’m generally scared to take the initiative because then it opens me up to possibly failing. It’s like I’d almost rather do nothing, and blame my crummy circumstances on everything else, than take the jump and put myself out there to get knocked down. My Dad was highly competitive, too, and would always say, “If you come second, you’re still a loser”. Nothing was good enough but perfection. Combine that with shyness and my Mum’s procrastinatory skills, and bam! Thanks, Mum and Dad! Reminds me of the Larkin poem This Be The verse. But I’m tired of dreams filling my head, dreams I never come close to accomplishing or even acting on at all. And so, in the year in which I’ll hit the big three-oh, I’ve decided to get a grip, at long last, and achieve my goals. And this time I’m for real; I’ve even bought a plastic ringbinder. I have moved beyond, ‘failure is not an option’, to, ‘even failing is a sign I am moving’. And moving is the first step towards moving forwards. So let’s start failing forwards instead of failing through inaction. Carry on with Spanish, course after back-to-back course, until I have achieved DELE (Diploma en Espanol como una lengua extranjera) C1. Do one Swedex Swedish qualification a year starting with A2 this year. I will then achieve a TISUS (C1 level) in four/five years. Successfully complete, again, (1) Duff’s Elements of New Testament Greek, and go on to do, (2) Taylor’s Greek to GCSE part 1, (3) Greek to GCSE part 2, (4) Taylor’s Greek Beyond GCSE, (5) a Classical Greek GCSE, (6) a Classical Greek A-Level. Start to learn Modern Greek: do GCSEs and A-Levels in it. Start to formally learn Basque (I already know some basic stuff). But I won’t start this for maybe three years until I have boosted up my Spanish, Swedish, and Greek. So, I’ve written it down, now: the Internet Gods will not be best pleased if I give up. Check back in a year to see how well I am failing forwards.